Frere studied under Jules Coignet and Camille Roqueplan in Paris and was a frequent contributor to the Salons from 1834 through 1887. 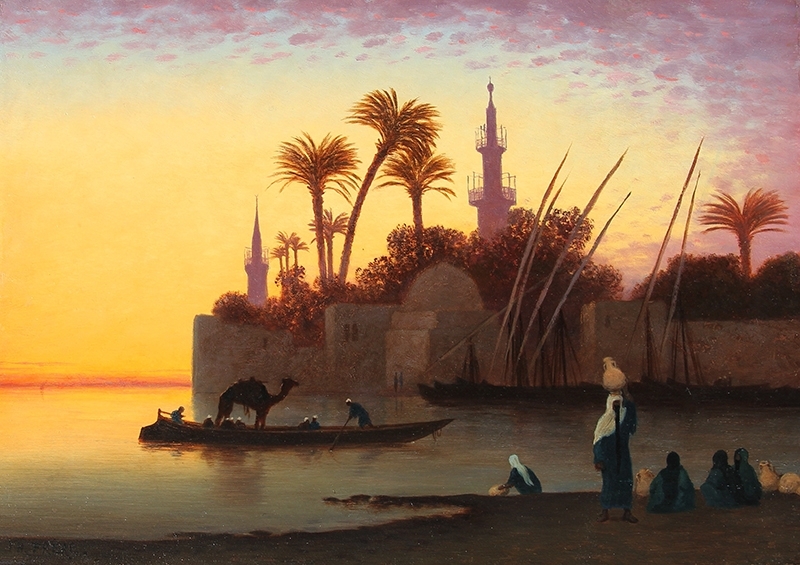 Though his first entry to the Salon was a view of Strasbourg, a subsequent trip to North Africa had a lasting effect on his work, and from 1839, his Salon entries were of Orientalist subjects. He lived in Algeria from 1837 until circa 1839, and traveled in the 1850’s through Constantinople, Egypt, Palestine, and Asia Minor. Egypt had a profound influence on the artist and his sensitive depictions of the environs unique to this land earned him international regard. He was also highly acclaimed in Egypt and the title “bey” was bestowed upon him by the government, encouraging him to maintain a studio in Cairo. In 1869, he accompanied Princess Eugenie to Egypt to witness the opening of the Suez Canal. He obtained medals for his entries to the Salons of 1848 and 1865 and built his reputation as an artist on these Orientalist subjects. Frere’s views of Arab landscapes were popular with the European collectors of the time, notably King Of Wurstemburg, Louis-Phillippe, as well as American dealer George Lucas from 1860 onwards. His works remain in both private and museum collections across France and America. Please contact us if you are interested in selling your Charles Théodore Frère paintings or other artwork from the 19th century and early 20th century.